Discover a Season of Endless Activities at the Ocean’s Edge! The humidity is gone and the air is turning crisp. It’s fall in the Golden Isles! Activities abound on St. Simon’s Island, no matter what your taste: shrimp boat excursions, eco tours by kayak, off shore fishing, tours of local historic sites and world class golf! On October 10th The King and Prince Golf Course, Home of the Hampton Club re-opened after a full 6 month restoration project. The result is a beautiful 18 hole golf course which has been restored to its original splendor with spectacular marsh views. Along with the name change, and modernization of grasses, the course now boasts a brand new practice facility. This course is a must see for any avid golfer. Guests of the resort receive a special rate of $79 to play. 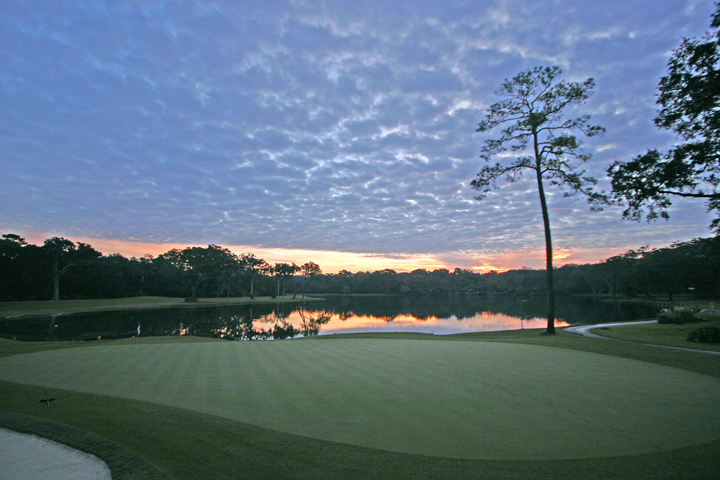 We invite you to try out our new course and find out what St. Simons Island’s best kept secret is all about! If Golf isn’t your game, watch history come alive on St. Simons Island as you tour our beautiful Lighthouse and Maritime Center. The Lighthouse, completed in 1872, and stands 106 feet high. This gives both adults and children a stunning view of the pier village area, St. Simon’s Sound and Jekyll Island. The Maritime Center is located less than a mile from The King and Prince and has natural history and marine life exhibits as well as artifacts from the original St. Simons Coast Guard Station. You can purchase combination tickets to both the Lighthouse Museum and the Maritime center. For more information please visit their website. For those that love the ocean, come see a different side of the island – from the water! There are many adventures available out on the ocean and on the intracostal waterway. Spend a few hours on a working shrimp boat (my personal favorite) or take an Eco Tour in a Kayak with Southeast Adventure Outfitters. 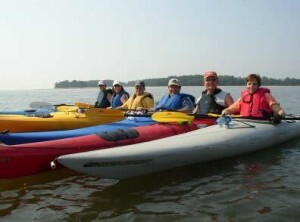 SEAO is owned and operated locally and their seasoned professionals will take you on a guided kayak tour. Many different tours are available from St. Simons, Jekyll, Cumberland and Sapelo Island. Whether you are interested in a 2 to 3 hour tour or spending the whole day out on the water you are bound to see fish, shorebirds, and maybe even a sea turtle or dolphins! Join Captain Larry Credle with Credles Adventures aboard the Lady Jane for a fun and educational experience for both young and old! Larry operates the only coast guard approved shrimp boat in the U. S.. Take a ride on his boat and enjoy learning about coastal ecology, watch the crew drag the nets and then take a look and see what the nets bring in! From shrimp, jellyfish, horseshoe crabs, small sharks and puffer fish the captain and his crew will even give you a chance to touch some of the sea-life that they pull up! See dolphins up close as they follow the boat hoping to snack on the fish and shrimp that get thrown back. The cruise also includes fresh Wild Georgia Shrimp that’s cooked right on the boat for you to enjoy. Fall in the Golden Isles is a wonderful time to take advantage of the mild weather and great activities. Plan a trip to The King and Prince and enjoy a game of golf or learn about coastal ecology. We look forward to welcoming you to our Resort this Autumn! Announcing the Winner of the October Facebook Photo Contest! Also, News on the November Contest & Kayaking from Maine to The Keys! We are pleased to announce Don Gilliam as the winner of The King and Prince Facebook Photo Contest! Don took an amazing shot from his Oceanfront room balcony of a dolphin jumping out of the water. The photo captures what our guests have been telling us for years-that they can literally sit on their balconies and watch the dolphins play. (Just think how lucky those people on the boat were!!) Don will receive a complimentary two night stay at our historic ocean front resort. We had a tough time choosing a winner as we loved so many of the photos that were submitted. 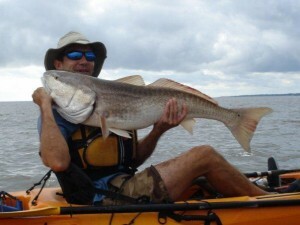 Michael Gowen of Southeast Adventure Outfitters posted two different photos from his kayak, one with the hotel in the background the other with a redfish that he had caught. It highlights some of the great activities to which our guests have access to from our hotel. 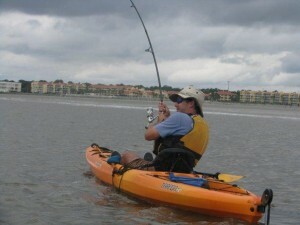 Fishing, kayaking and nature tours! ….I wonder if he threw the fish back? Laurie uploaded some photos of her family at the King and Prince. I especially love the photo of her husband and son walking on the beach. Family is such an important part of who we are and what the King and Prince represents. So many families from across Georgia come to the ocean’s edge every summer and create lasting memories here at our resort. We are so thankful that they choose our home and St. Simons Island to spend time with their loved ones. I recently had the opportunity to meet an inspiring young couple- Dan and Bethany Cox. These newlyweds set out on the trip of a lifetime: To Kayak from Lubec, Maine to Key West, this had been a goal of Dan’s since he was a teenager. What they thought would take just a few months has turned into almost a year. With a stop off in Portland, Maine for the winter (I can’t even imagine trying to kayak those cold, New England waters in the winter!) 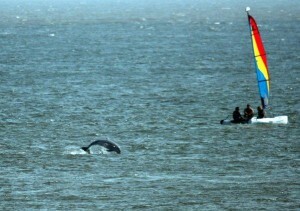 they put their kayaks into the water in May to continue their adventure south. On October 26th, they made it to St. Simons island and took a rest right here at The King and Prince. Dan and Bethany shared many stories with me….about the kindness of strangers, the lessons they have learned along the way and the amazing memories that have been made throughout their journey. 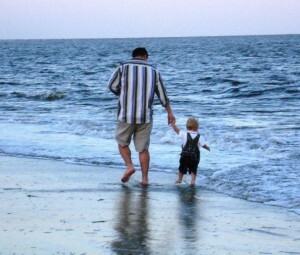 It made me wonder what memories and stories our guests have about our resort and St. Simons Island. In November we invite you post your favorite memory about The King and Prince or your favorite memory of St. Simons Island. All entries will be entered to win a complimentary two night stay for up to 4 people at our resort. To enter you must first become a fan of The King and Prince and then write away! I know my fellow co-workers and I look forward to reading about everyone’s memories. PS-Don’t forget to become a fan of The King and Prince and check out Dan and Bethany’s Blog as well! They are in Florida and are so close to their goal of making it to the Keys!